This is a review for the supplement Thera Botanics Cebria. The manufacturer claims that this supplement will improve memory. Read on to learn about this product and whether or not it is the ideal choice for you. Please note: This supplement is gluten-free. However, is contains lactose which may affect those individuals who are lactose-intolerant. It is recommended that one capsule be taken daily. The manufacturer’s website did not list any possible side effects. It was noted that those who have a known medical condition and are pregnant and nursing should consult with a doctor prior to taking this supplement. Those who lactose intolerant should not take Cebria, as it could have negative consequences to their health. This product regularly costs $79.99 for a bottle, but the manufacturer is offering a risk-free trial of the product. What this means is that customers will not have to pay anything for their first bottle unless they choose to continue receiving the product, which will then be sent to you every 60 days for the cost of $39.95 for each of the two boxes sent to you. We are very wary of such offers, our experience shows that it is often very difficult to cancel should the product not work for you. The manufacturer does not offer a guarantee, but they offer a risk-free trial that allows you to try out the product before making the decision to purchase it. If you return the unused portion of the product within thirty days of purchasing it, you will not be charged for Cebria although you do have to provide your credit card details. This is risky. There are several positive reviews available on the manufacturer’s website which provides consumers with an overview of how beneficial the product is so that they can decide if they want to try it. Keep in mind that individual results may vary, so just because someone else experience positive result from this supplement doesn’t mean every buyer will. 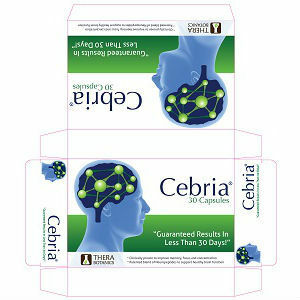 Thera Botanics Cebria is said to improve memory and there are several customer reviews on the manufacturer’s website that back up this claim. However, we would like to have seen several other benefits that this products has for enhancing cognitive energy. Many of the other products we reviewed held other significant benefits such as improving attention and being more focused as well as improving memory. It would appear, at first glance, that the free trial this manufacturer offers is a positive option. With customers being able to try out the product before having to purchase it, this allows them to make an informed decision about the product before deciding to continue use. Not many manufacturer’s have risk-free trials that allow customers to try the product before they buy it. However, consumers must present their credit card details to take advantage of the free trial. This made us slightly nervous as many companies will continue charging your credit card even when you no longer want the product. Even without the risk-free trial, this supplement is still relatively affordable for most. That said, many people are excluded from being able to use this product as it contains lactose. With so many lactose-intolerant consumers out there, we questioned why the manufacturer would include this in their formula. However, it is gluten-free, so those with a diet that restricts gluten could take this supplement. Henry Costa	reviewed Thera Botanics Cebria	on June 17th	 and gave it a rating of 3.